"Time was not available during the 2010 expedition to apply the SeaBotix ROV (Remotely Operated Vehicle) ​​technology to the McMoneagle hypothesis, but if and when TIGHAR gets back to the ​​island for more deep-water searching, I hope such a test will be included in the ​​research plan." ​​​Tom King - Senior Archaeologist - the TIGHAR Group. ​It fell right into our lap. The underwater ridge refered to in our book, actually sits in 650 feet of water from 1300 to 1400 feet off the Southeast end. ​The ridge that stopped the plane's underwater roll turned up at our numbers​​ (yellow arrow). This Nikumaroro ocean floor image was taken by PhDs at the Hawaii Underseas Research Laboratory (HURL) and was subsequently cut in half by the TIGHAR Group denying the public access to the complete picture! It is shown below for educational and criticism purposes. Our 1998 information indicated the plane was in the southeastern waters. 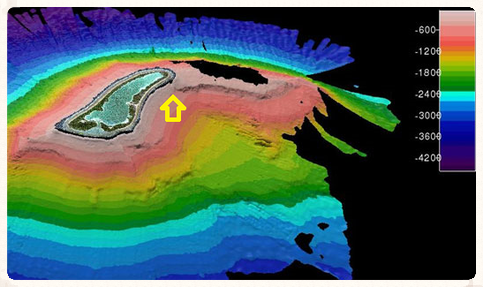 This was not credited until 2012 when PhD's at the U. of Hawaii proved our underwater ridge prediction existed off the Atoll's Southeast end at the numbers we indicated. But TIGHAR still insists on a very personal Northwest end safe landing theory. So, in 2015 did TIGHAR look where we indicated? What made TIGHAR's 2015 trip different was their two ship strategy. This was not a supply ship arriving a week later and then departing. to search for evidence of castaways! Observers with any savvy realize the TIGHAR Group's Castaways Theory has no legs. So 18 months after their 2015 trip, the public was treated to the multi-million dollar History Channel ﻿(TM) farce the Saturday night before the Amelia Earhart Birthplace Museum Festival in July, 2017 (A one chance in 52 timing coincidence). But their apparently Photo Shopped (TM), blurred out Amelia Earhart face was discovered published two years before her last flight! Nonetheless, the Atchison, Kansas Chamber of Commerce was found distributing the picture and actually into the museum as well! Next - to protect the ruse - authors who traditionally present their Earhart books to round out the Earhart show, were "accidentally" obstructed from making presentations for the first time, due to "poor planning." How many coincidences are necessary? This Catamaran type vessel used was the Fuji Princess. In 20152 this tourist ship was located on Nikumaroro's south side. It had every opportunity to troll the area we have been referencing for decades. The smaller research ship, the Nai'a, was over on the West end searching for evidence of Castaways (see below). Stern side. A magnetometer (below left) could easily have trolled the area we have outlined (above) while the Press focus was on the West end "research" ship. here to edit and add your own text. This picture (left) provides an example of a standard, cheaply rentable, ocean floor metal scanner, aka Magnetometer. This could have been deployed above the underwater ridge (top graphic) to determine if any metal debris existed. This is TIGHAR's 2015 research yacht the Nia'i (lower right) off Nikumaroro's west end. After all the equipment used by the U.S. Navy's deep sea contractor in 2012, it was amazing to see how small a boat could be used - unless it never was the focus of the effort. The Fuji Princess (above) was on the south side where our debris field map has indicated to search since 1998. 1) Their non-supply ship strategy. ﻿2) Silence upon return. In the previous ten trips, The TIGHAR Group generally sang out about everything they had found. But in 2015, there was complete silence. With the subsequent History Channel charade, are they aware of something that is in the interest of Earhart mystery lovers? Ask yourself what was the motive for the millions in expense and the now unmasked subterfuge? ﻿Why can't you see Earhart's eye's, nose, or mouth, but you can see everybody else's in the same frame?